In case you've been living under a rock, director Patty Jenkins is the queen among queens who recently blessed us with the record-breaking box office hit Wonder Woman. But did you know that this isn't the first time Patty has rocked our world with her genius? Back in 2004, she directed Arrested Development's second season episode "The One Where They Build a House." What's a mayonegg, you ask? "Oh, it's so cute. She sometimes takes a little pack of mayonnaise, and she'll squirt it in her mouth all over, and then she'll take an egg and kind of...mmmmm! She calls it a 'mayonegg.'" 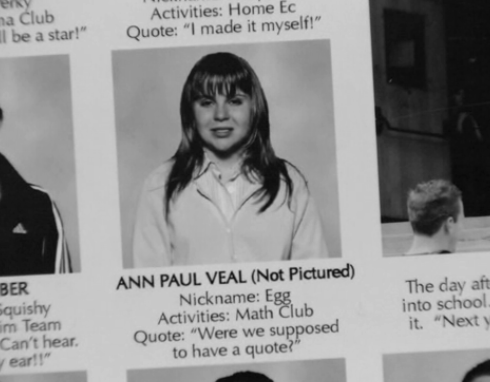 The "she" mentioned above refers to Mae Whitman's character, Ann Veal. Ann, George Michael's girlfriend, was drab and forgettable — in every sense of the word — creating a hilarious running gag throughout the series. Fans were pretty stoked when they learned of the superhero connection. Too much awesome for one person. NOT AS MUCH AS WE LOVE YOU, PATTY!